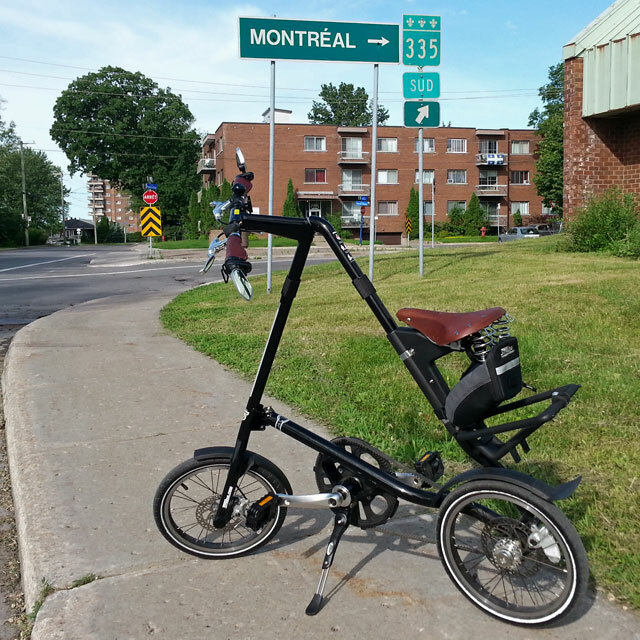 This Strida Photo Album contains photos of Strida Canada’s customers and their Strida bikes. 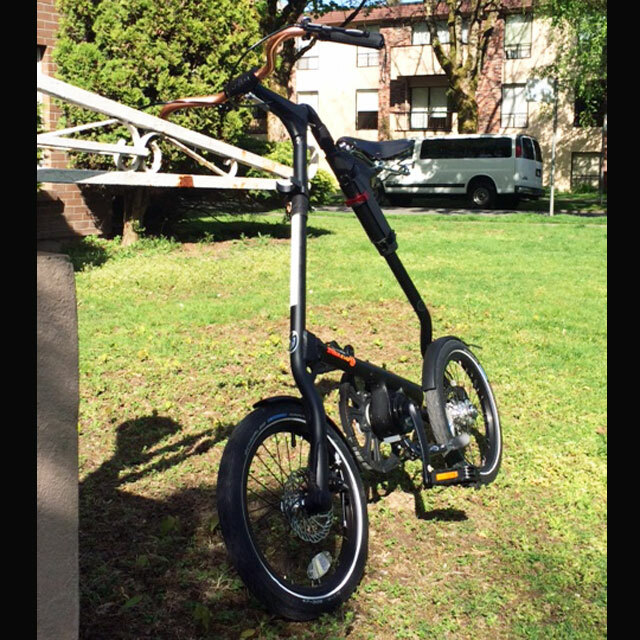 I think the Strida bike is fun to photograph and I would love to display a Strida photo of your Strida bike. 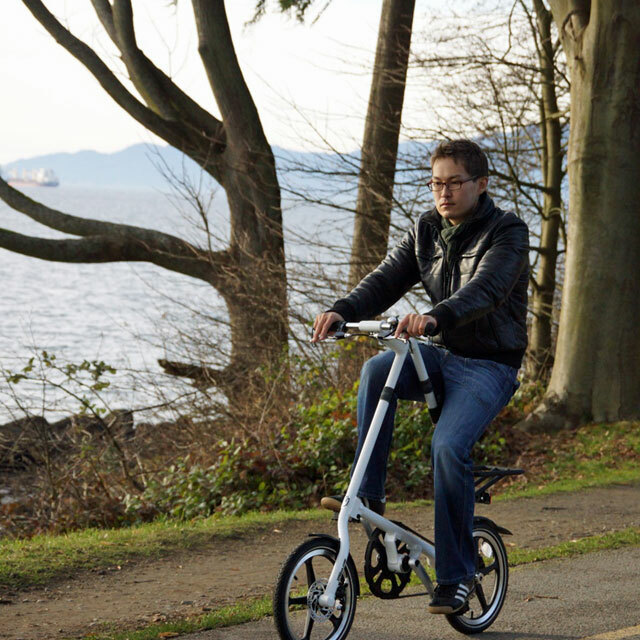 Or a Strida photo of you and your Strida. 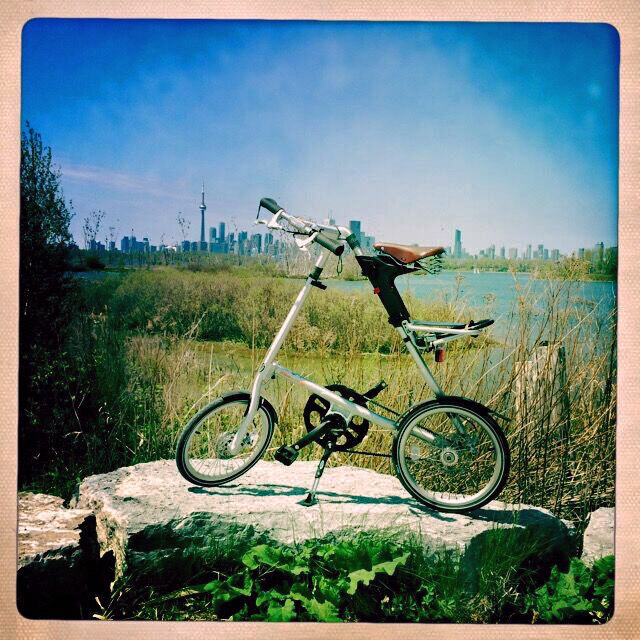 If you would like to be part of this Strida Canada customer Strida photo album then please send me your photos. 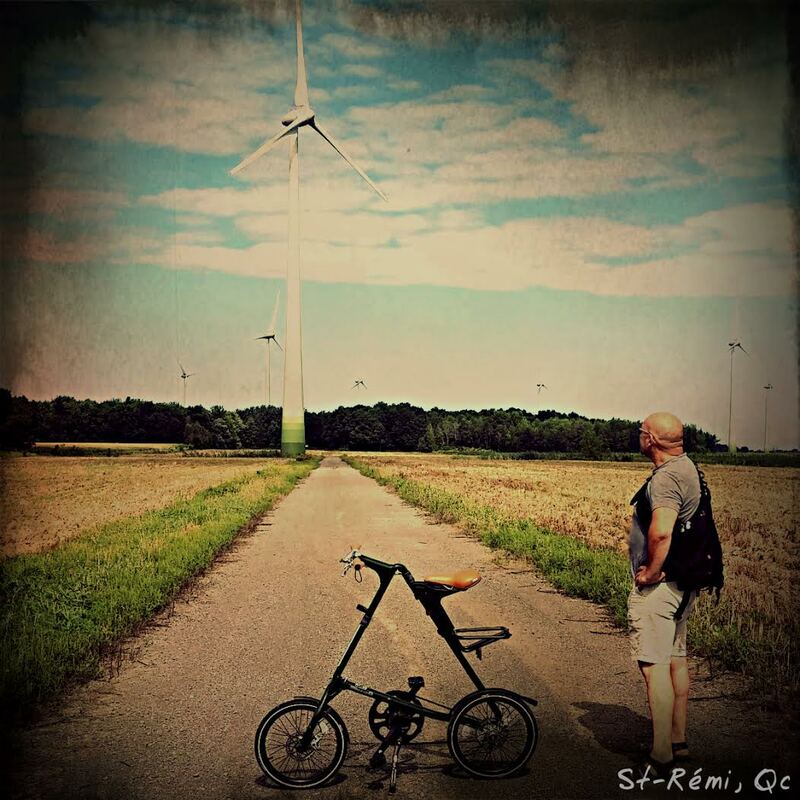 If I already have a Strida photo of you or your Strida and you would like to update it, then please send another. 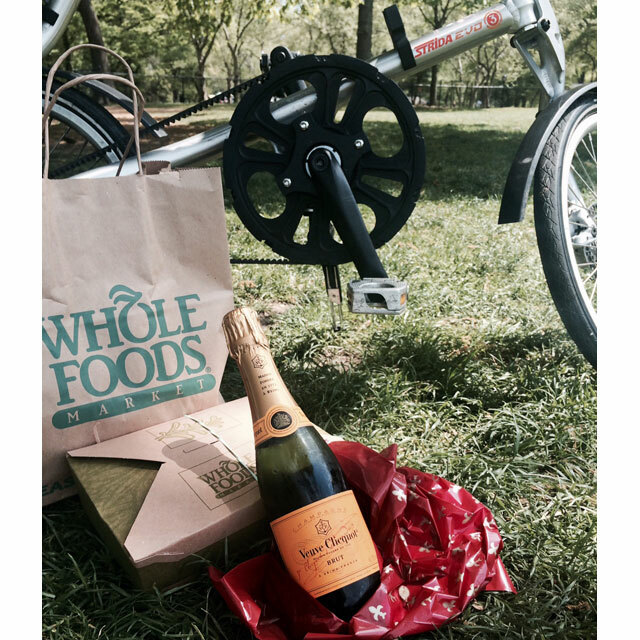 For more information of each photo please click on the Strida photo. 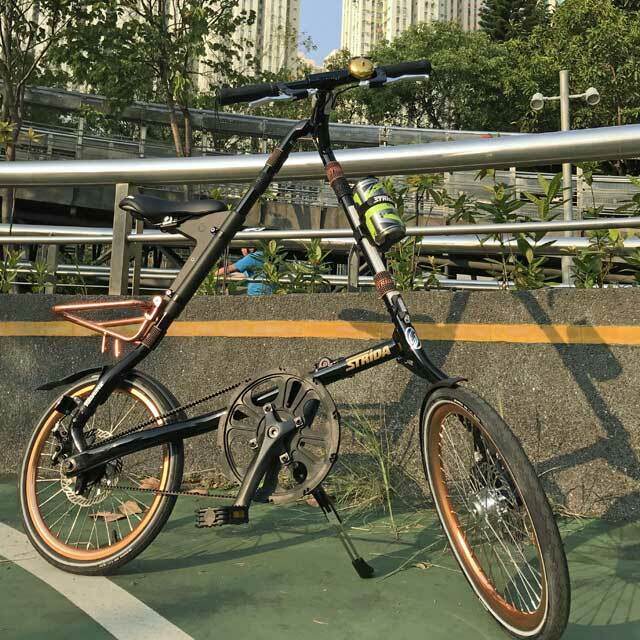 Anne sent me this photo of his Strida Lt, actually he sent me a photo of each of his three Strida bikes and I picked this one, nice photo and nice to have three Strida bikes to ride! 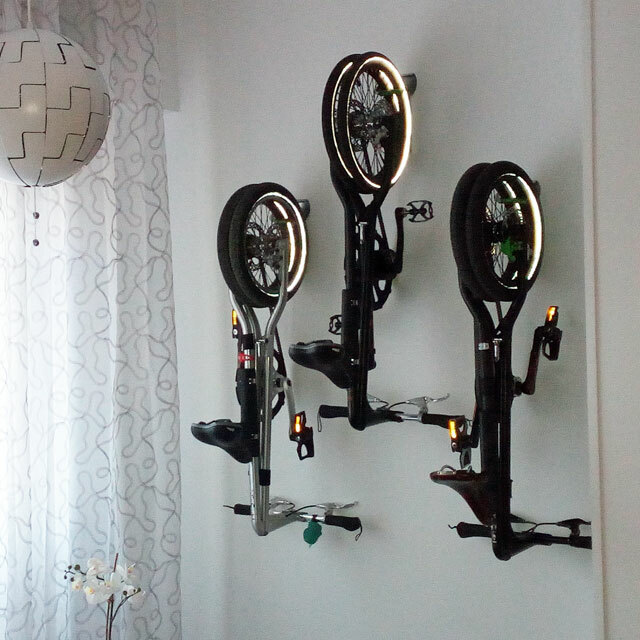 Alberto in Barcelona sent me this photo of his Strida bikes displayed on his wall, Strida = Art. Wolfgang in Heidelberg sent me this photo of him visiting a Christmas market. 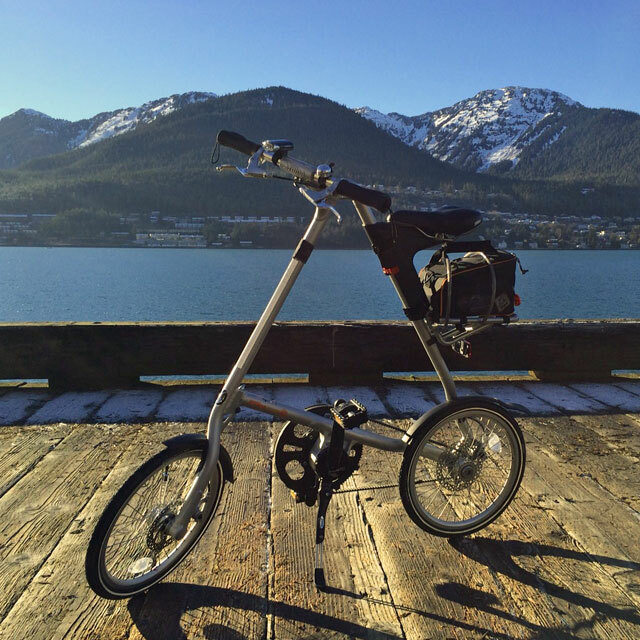 The Strida is a winter bike too! 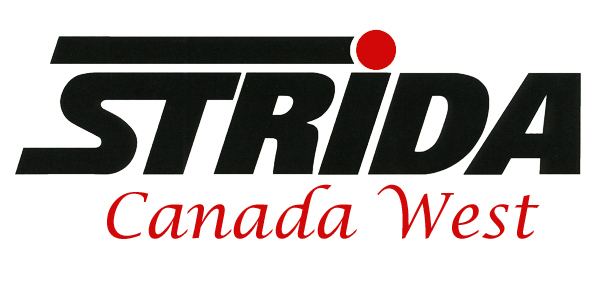 Keith is building his dream Strida Bike and it is a pleasure for me to be able to help. Copper and Black do look very nice together. 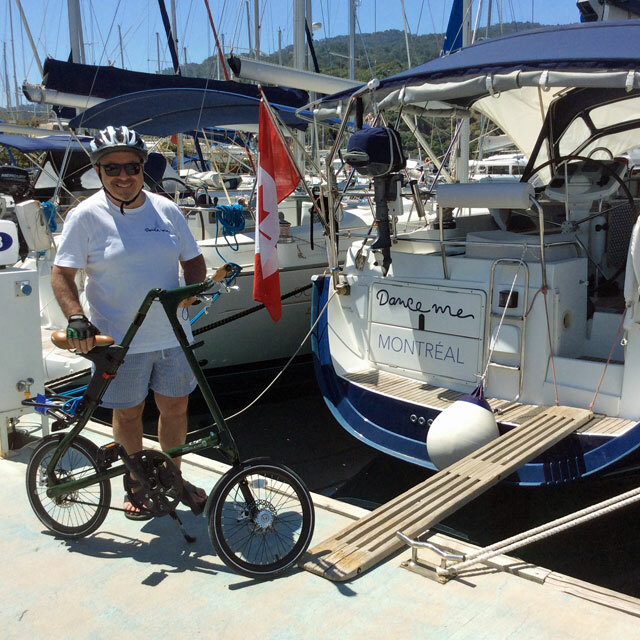 Jacques has discovered that a sailboat compliments a Strida bike nicely. 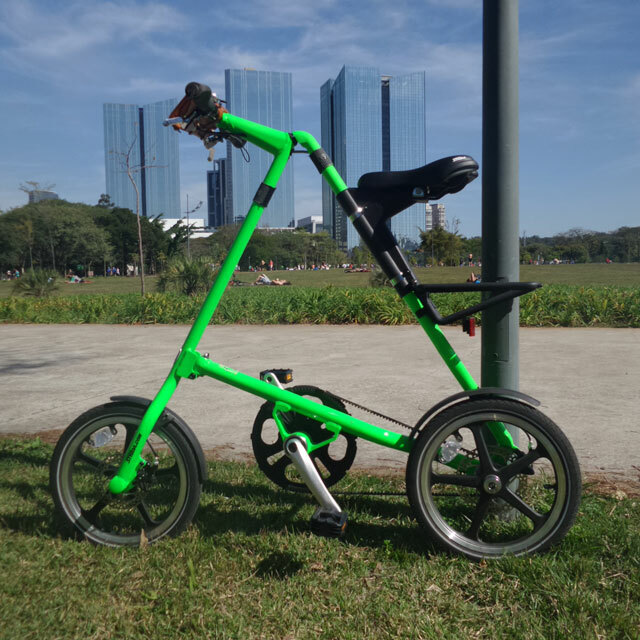 "Amazingly adapted to sailing, my Strida conveniently fits into the tight quarters of our sailboat, easy to Assemble & Go, perfect for provisioning. Love it!" 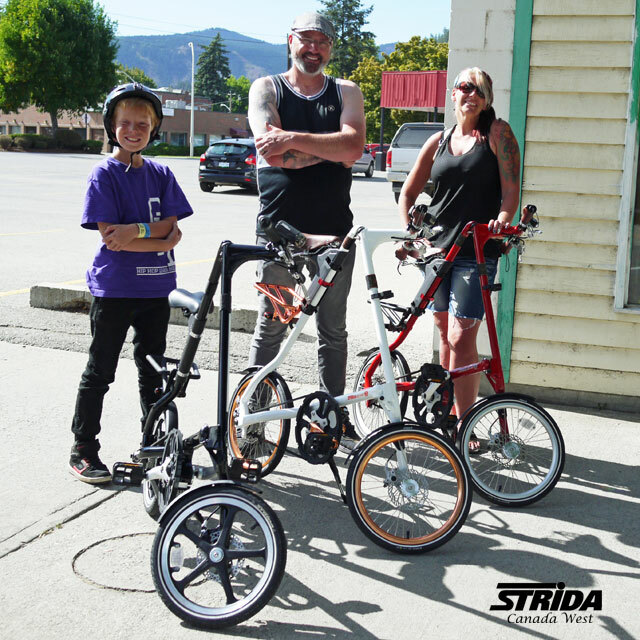 Coreena, Brandon and Mercury dropped by my shop this past summer and were impressed with the Strida bikes. 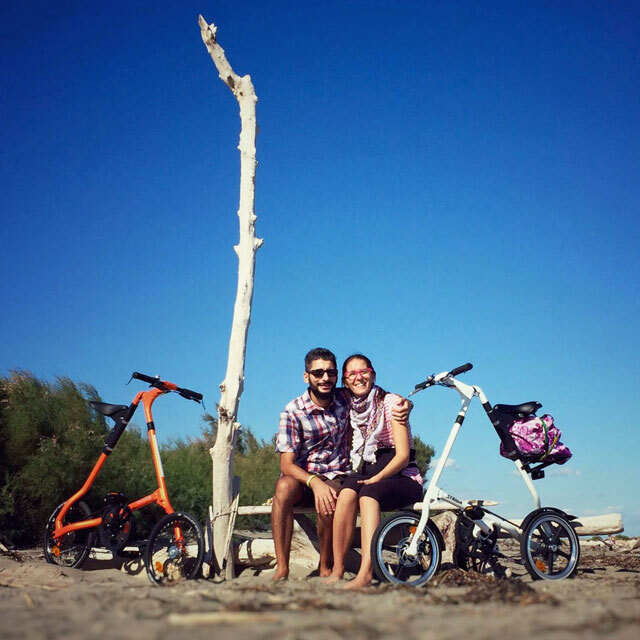 They liked how well the Strida bikes fit their RV lifestyle as they were on vacation. Now they each have their own Strida bike to enjoy riding together. Julie works as a mate on seagoing ships. 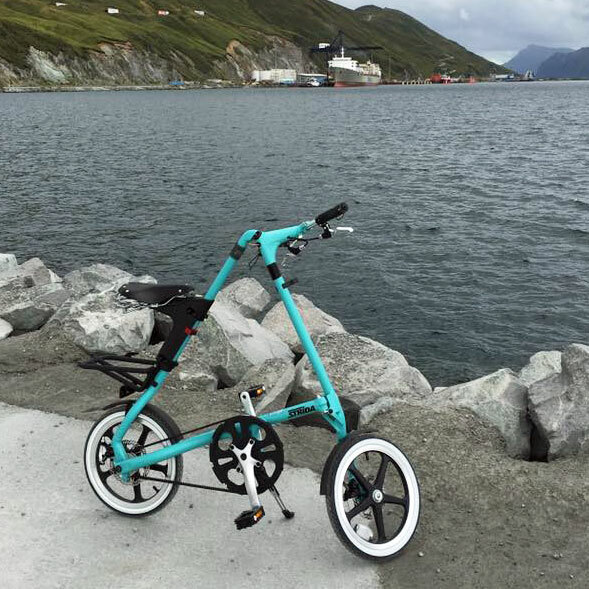 She purchased her Turquoise Strida Lt so that when the ship is loading and unloading she can stretch her legs. 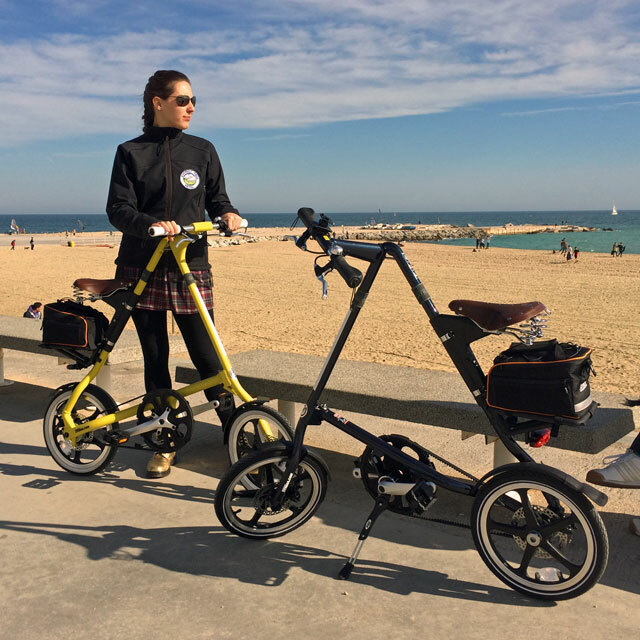 The Strida is perfect because it is easy for her to carry on and off the ship and store in her stateroom. This photo is from Dutch Harbour Alaska. 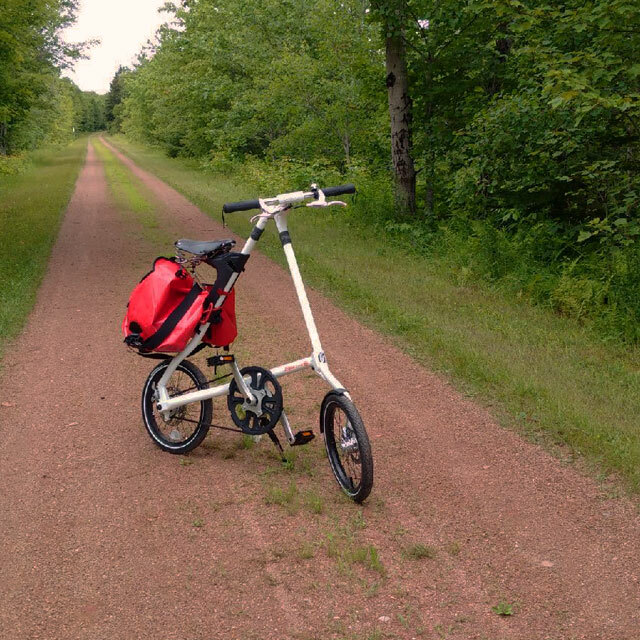 I love it when customers send me photos and tell me something about how they like to use their Strida bikes. Jim likes to watch large auto races. 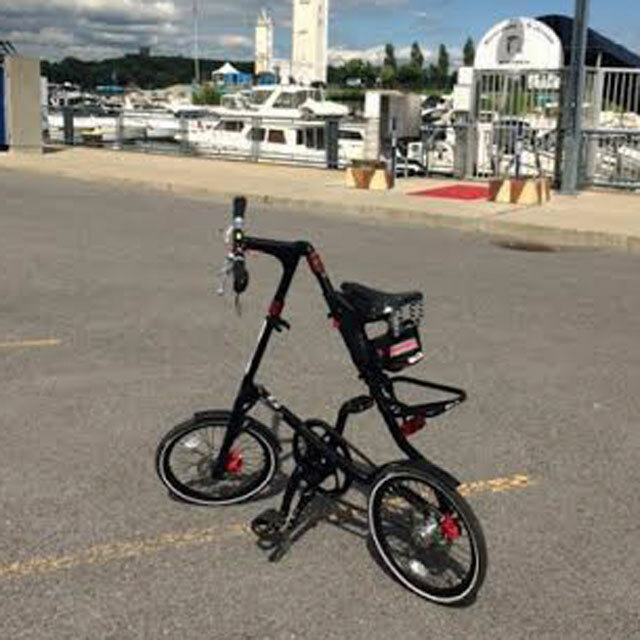 He uses his Strida to find the best viewing location. 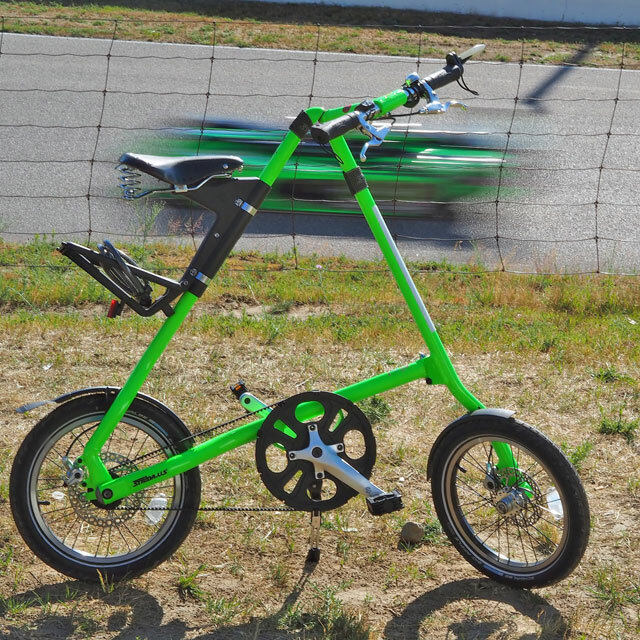 Without his Neon Green Strida JIm would have a lot of walking. So he loads it into his two seater sports car and he is off to the races. Thank you Ed for sending me this sweet photo of your white Lt upgraded with M-Style Handlebars. The round leather grips and leather saddle look great and must be very comfortable. Mark collects Strida bikes, this Pieter Smit SX model is 1 of 180 produced for the Netherlands distributor Vanmoof in 2010. 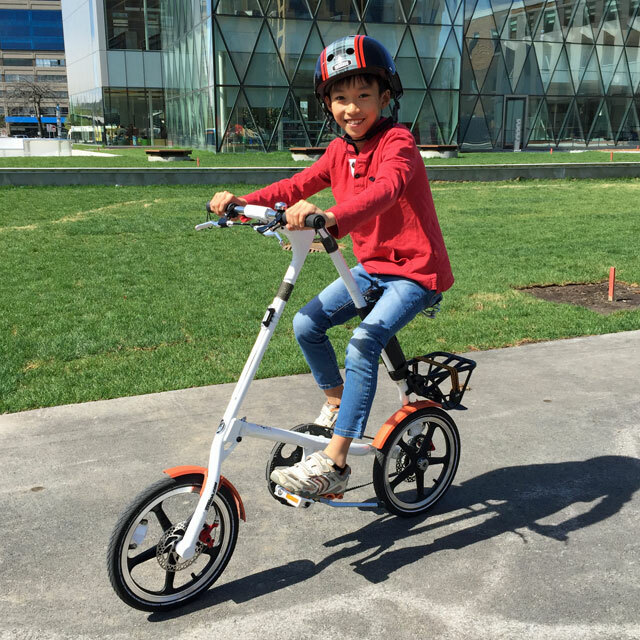 My customer Chinh in Montreal sent me this photo of his son riding his Strida Lt. One of the great things about a young person riding a Strida is that they will never out grow it. This Spring I helped Tom customize this matte black EVO, copper M-Style Handlebars, Strida Black leather saddle and 16 inch wheels. Sweet! Sergio in Montreal send me this photo of his new Lt. 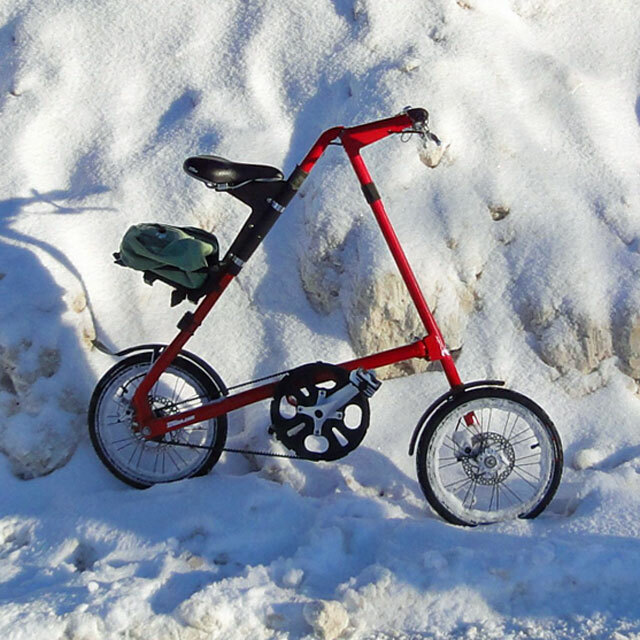 It takes a lot to keep a new Strida owner from riding his new Strida, not even a little snow. I love the winter light in this photo. Photo sent to me by Anthony in NYC. Enjoy yourself with your Strida, take it on a date once in awhile. Stop, sip the champagne and smell the roses. Actually this is Henry's wife's Strida Bronze EVO with copper M Style handlebars. Henry's wife is not very tall so she needs the seat mount installed in a low position. Notice the custom rack clip to hold the rack securely. The Strida Custom Rack Clip can be found in our parts page. Indy lives in New Westminster B.C. 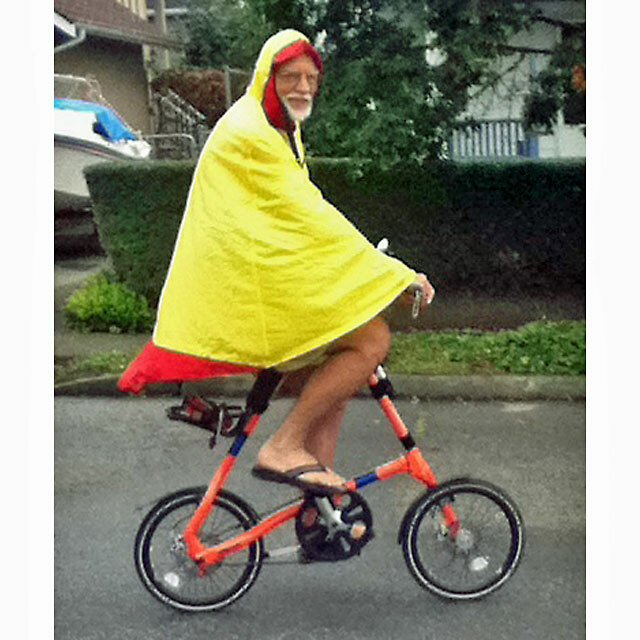 When it rains in New West Indy's custom rain cape keeps him and his orange Strida SX dry. 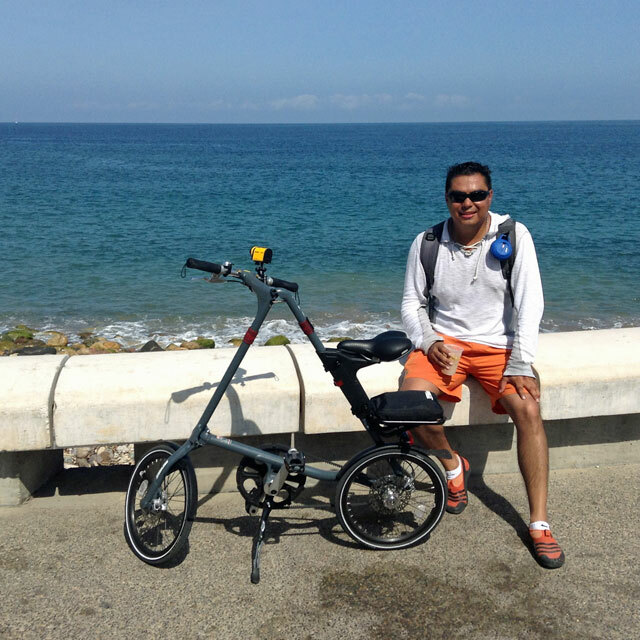 Edgar lives and travels in Mexico with his matte gray Strida SX. Say Hi to him if you see him ride by. Betty sent me this photo of her and her white EVO and a friend enjoying a ride in Kelowna B.C. 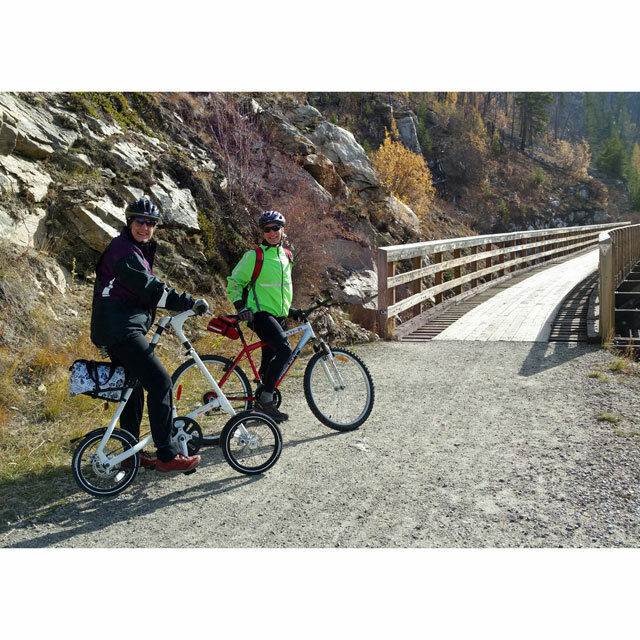 The trestle in the background is one of the many trestles in the Myra Canyon near Kelowna. 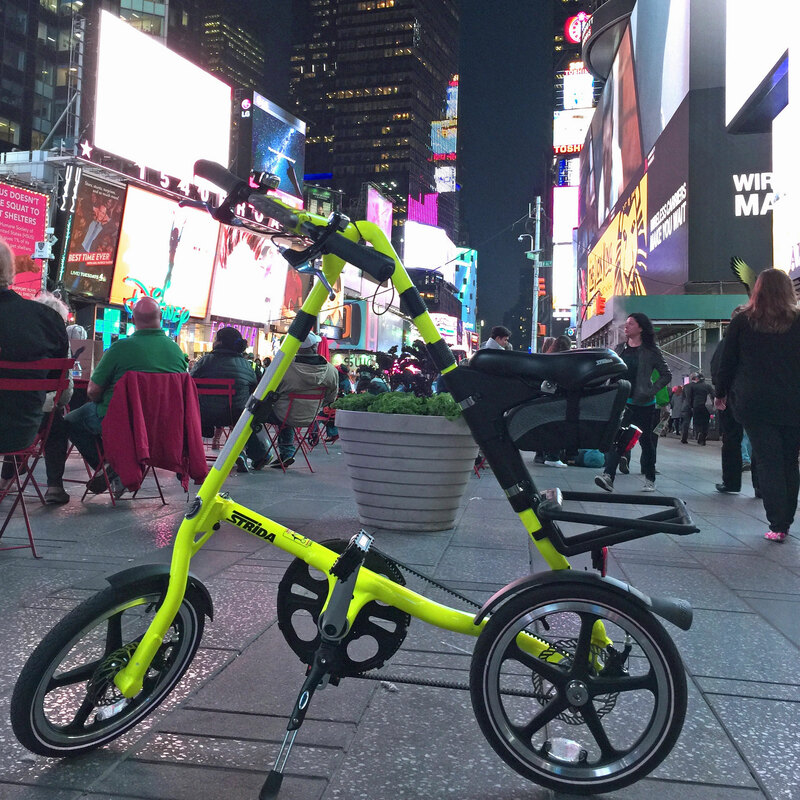 Is there a better colour of Strida to cruise Times Square then Neon Yellow? I don't think so! Marco sent me this photo of his Neon Yellow Lt taken in Times Square. 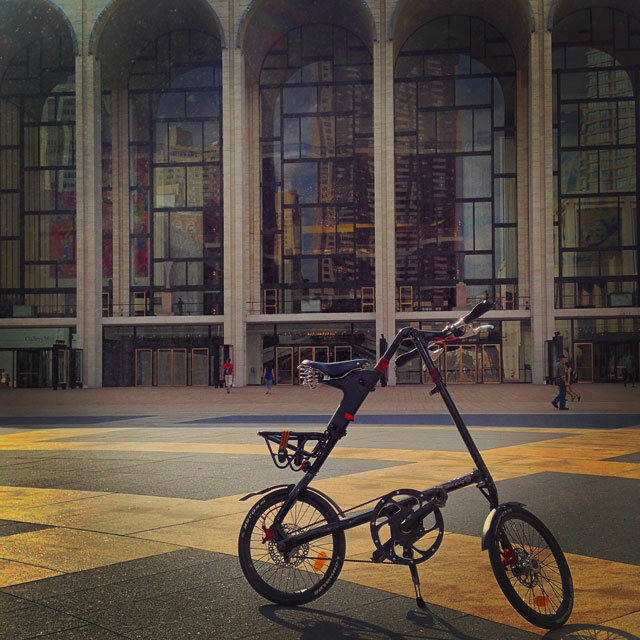 If you visit Times Square you might see him as this is home for him and his Strida. 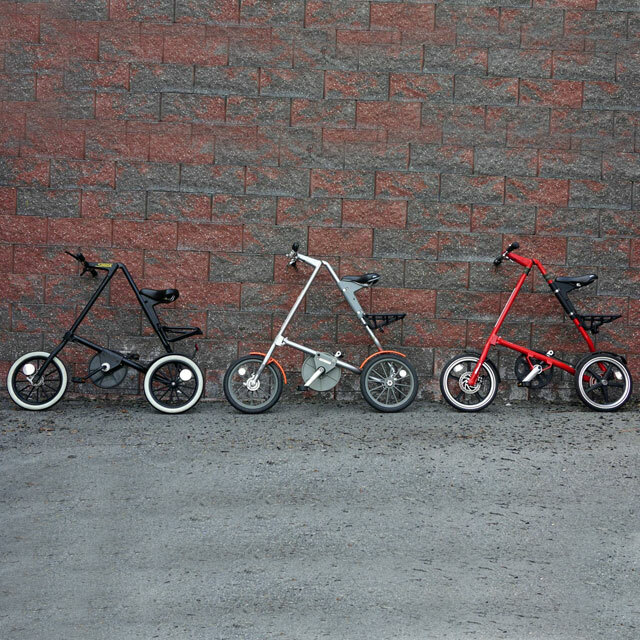 Dave sent me this photo of his three Strida bikes. 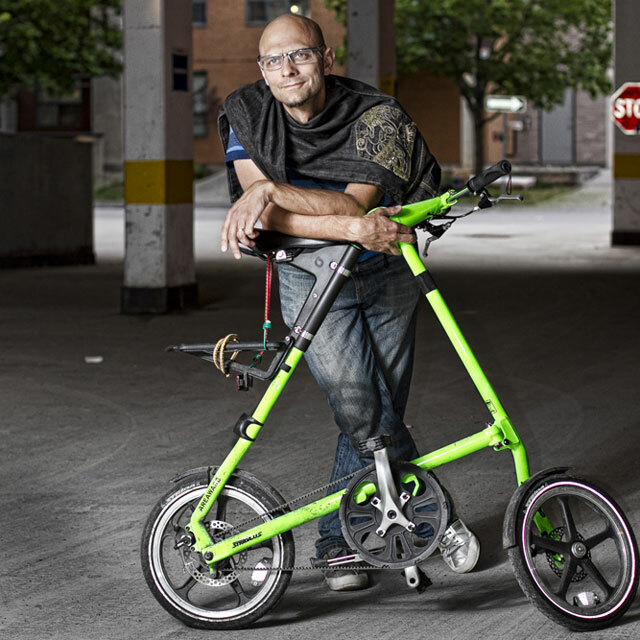 His first Strida was the grey Mk 3.2 purchased in 2007, then came the red Lt in 2011 and more recently the black Mk 1. He rides the Lt and the Mk 3.2 every week. Dave I am envious! David sent me this photo of his EVO taken when he was visiting the Canadian of Province of Prince Edward Island this summer. 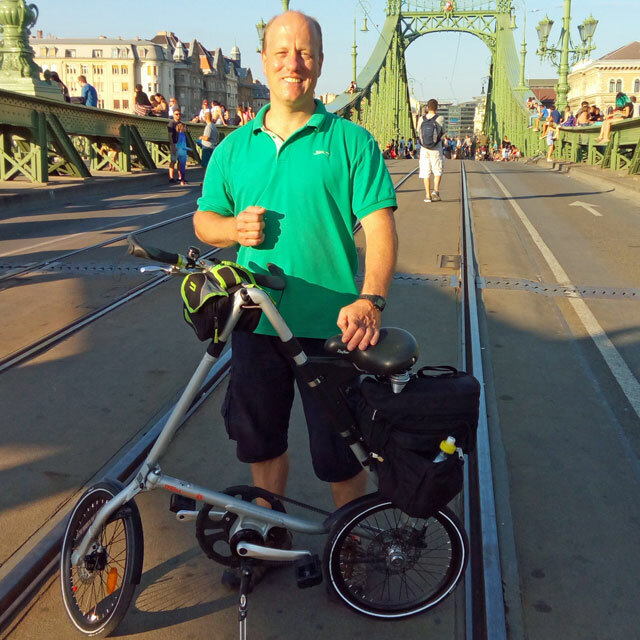 Martin with his Strida Dark Green EVO visiting St-Remi Quebec. 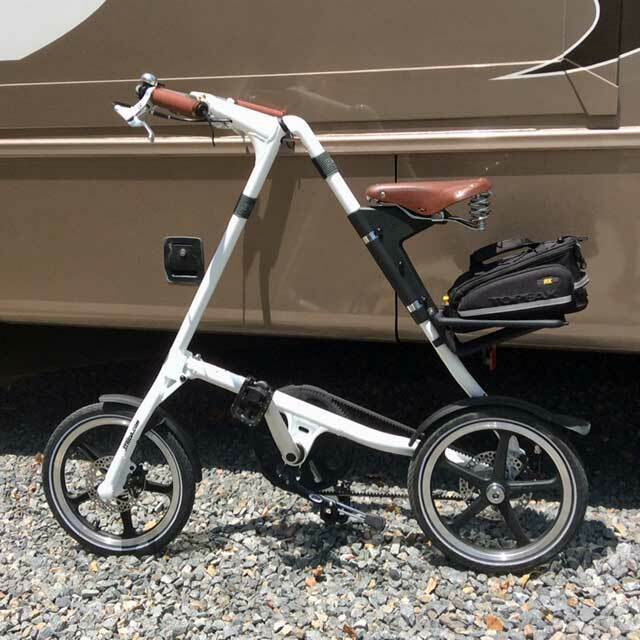 Phyllis likes to travel with her RV and her white Strida EVO. 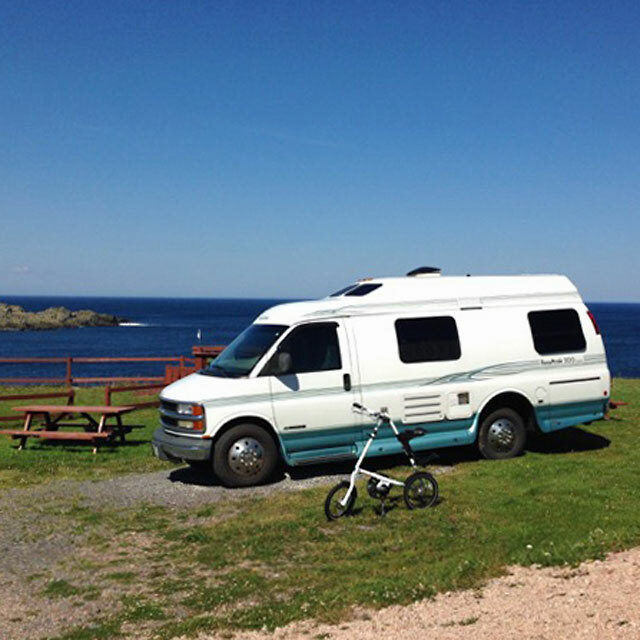 She sent me this photo of her RV and her Strida that she took in Grates Cove Newfoundland. 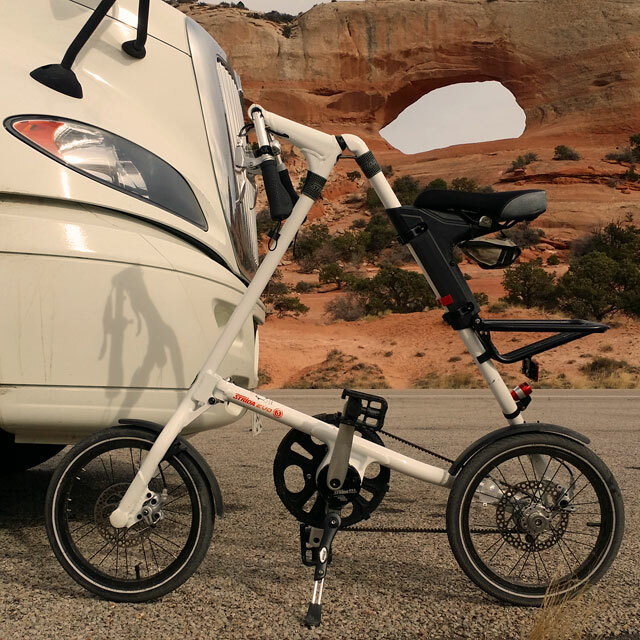 The Strida fits nicely into the RV's back storage compartment. Keep your eye out for Phyllis as you may see her just about anywhere. 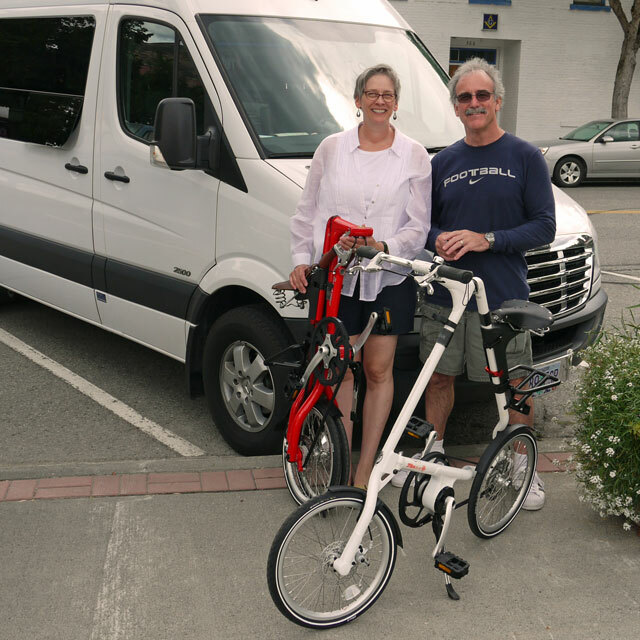 Steve and Audrey dropped by the shop and purchased two Strida EVOs to use with their camper van. In their travels they had been looking for the perfect folding bikes to transport in their van. The two Stridas fit perfectly attached to the back of their front seats. 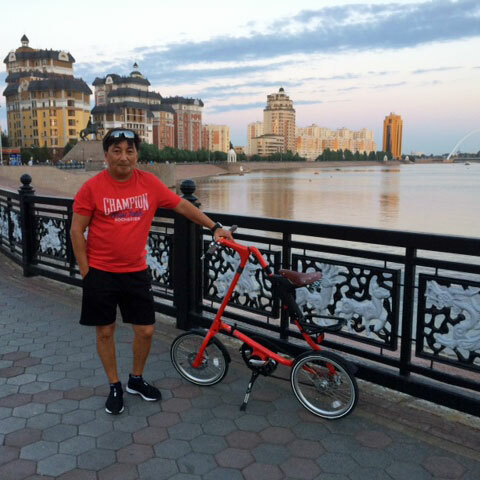 Strida bikes do like to travel and this Red and Leather EVO has found a home with Yerick in Astana, the capital of Kazakhstan. If this Strida EVO looks familiar then it just may be, this Strida is the display Strida from the Smithsonian Cooper Hewitt exhibit, Beautiful User, in NYC. 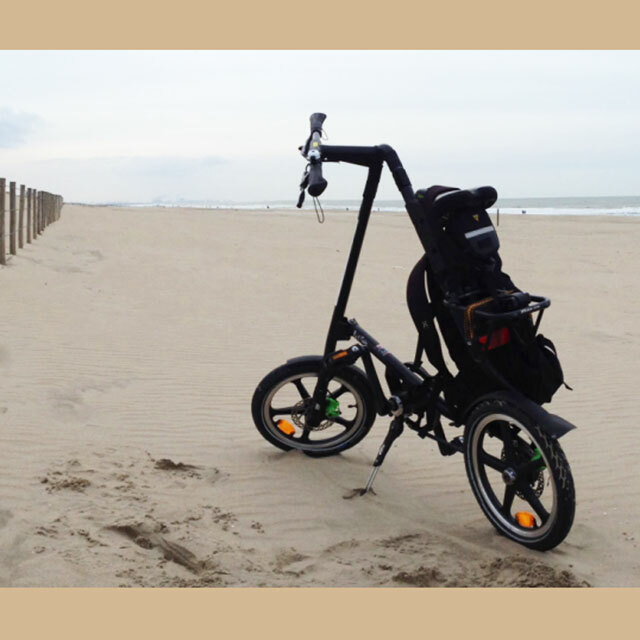 Richard took this photo of his Strida Lt in one of his favorite places, on the beach near Duindorp Netherlands. Richard noted that this is a place he rides to, to clear his mind. 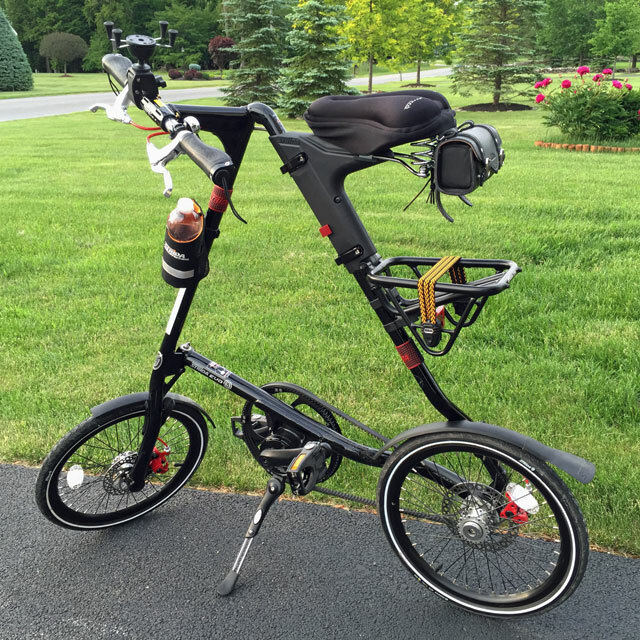 Jo has added some goodies to her Strida 5.0. She has added the Strida leather saddle and matching leather ergo grips. For storage she has a Strida saddle bag. 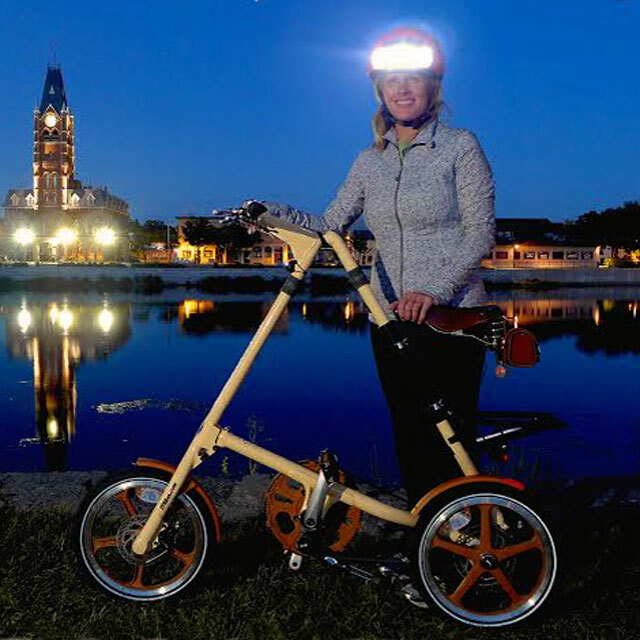 A Strida handlebar mirror set gives her good visibility behind. The Strida mirror set includes end loops so that you can still lock the brake levers. Another Manhattan Special, this one is Ivans and he lives in New Hartford. Ivan has added the Strida leather saddle bag and a gel cover for the Strida leather saddle. He also uses the Strida water bottle holder. Small space? 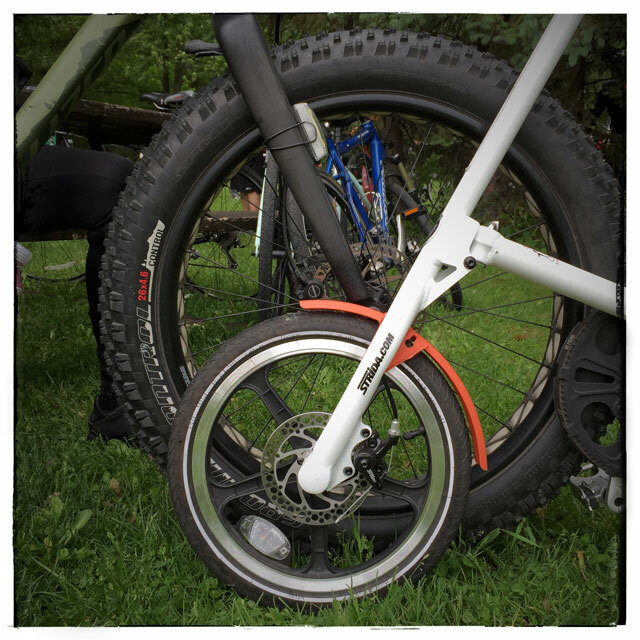 No problem as seen in Evan's photo of his Strida Cream & Brown 5.0. 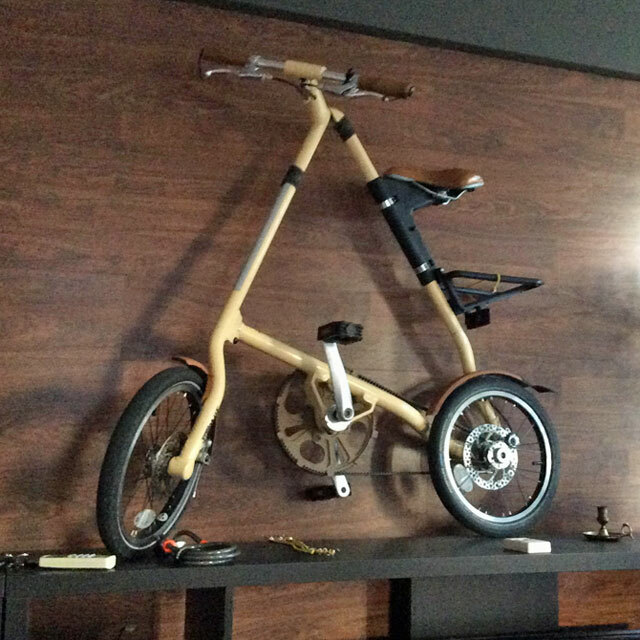 Or if you have lots of space you still may want to display your Strida as art when you are not riding. Stephen's polished aluminum EVO with the Toronto sky line in the background. This photo was taken by Stephen at Leslie Spit, a bird sanctuary created by landfill from construction and demolition in Toronto. Jim rides his neon green Strida Lt year round in Ottawa, I have been supplying Jim with parts to keep his Strida on the road. If you see him on the streets of Ottawa you may notice he has recently added M-Style-Handle bars to his bike. This photo and the linked photo album are from Ottawa Velo Vogue Blog. Otavio purchased his neon green Strida Lt from us while he was attending a conference in Las Vegas. 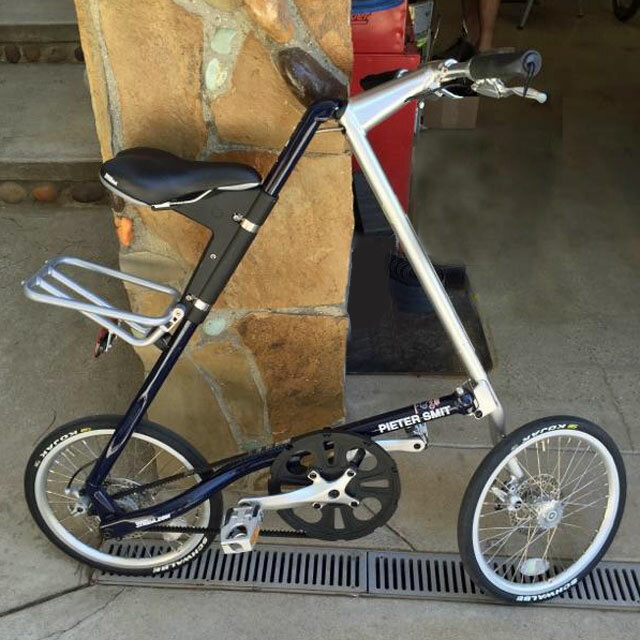 Randy purchased two of the first Strida EVOs that I sold, for himself and his wife. They are pictured here with the Olympic Torch during a visit to Vancouver B.C. Viateur took this photo of his Manhattan Special posed in front of the Montreal Yacht Club in Montreal. 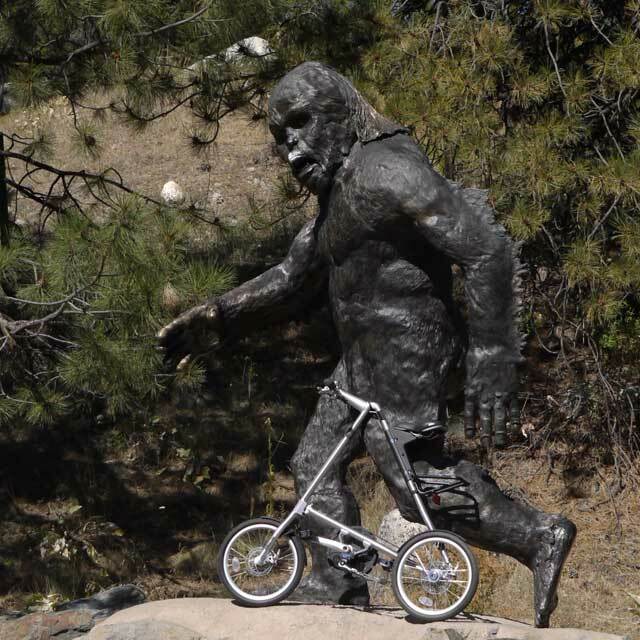 Big foot loves his Strida Sx, folds fast and always ready for that quick get away. The one thing he wishes for, bigger pedals, as it is he has to pedal with his toes! This photo is of Timur with his White Srida Lt riding the seawall in Vancouver. The Seawall is a scenic 22 km path that lines Vancouver's waterfront. 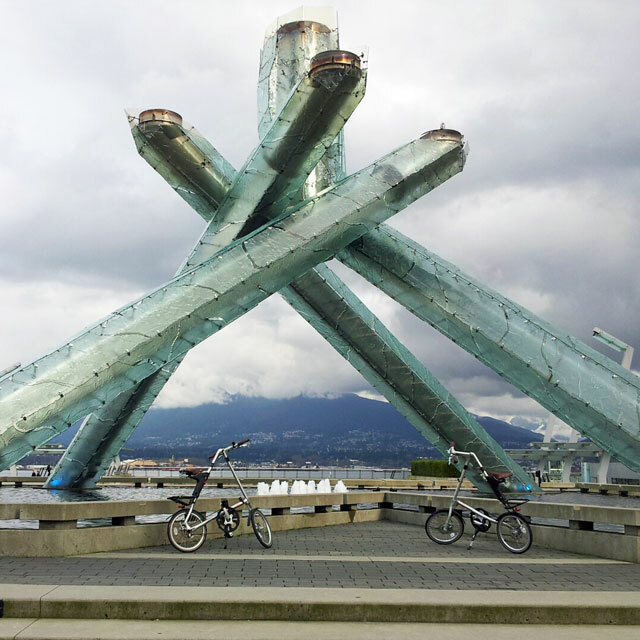 Great place to ride your new Strida. 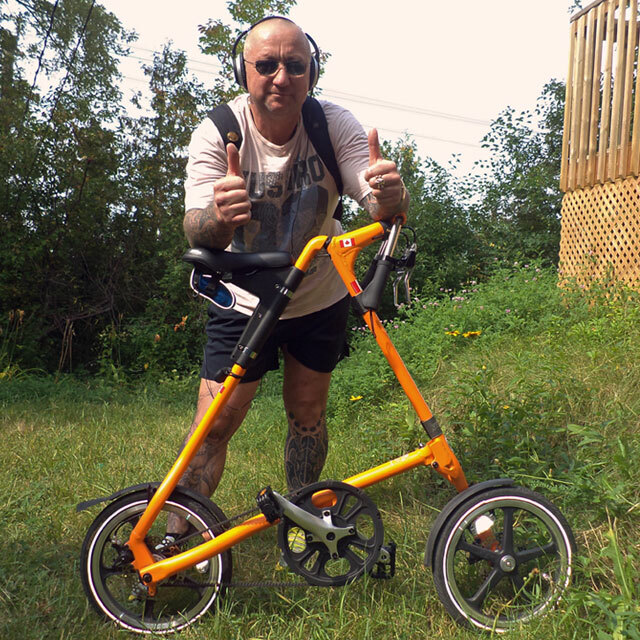 Vladimir posing with his Strida Lt Sunkist orange, the first one in Toronto. 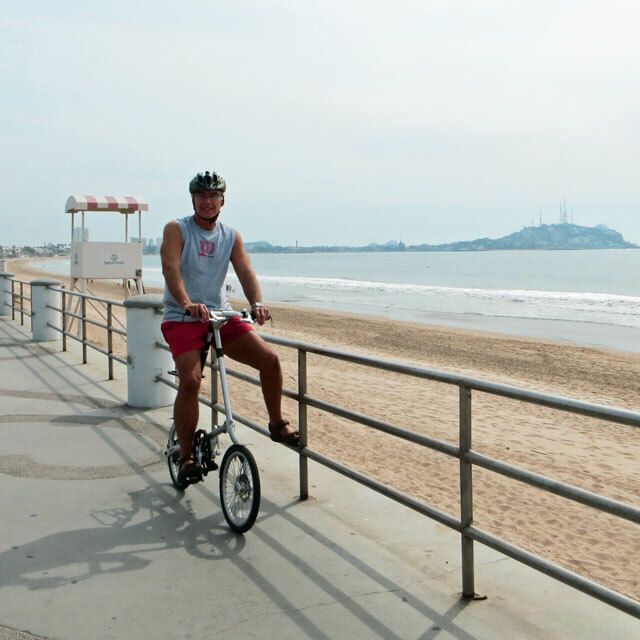 Steve lives in Mexico during the winter and uses his Strida SX to ride the sea wall. 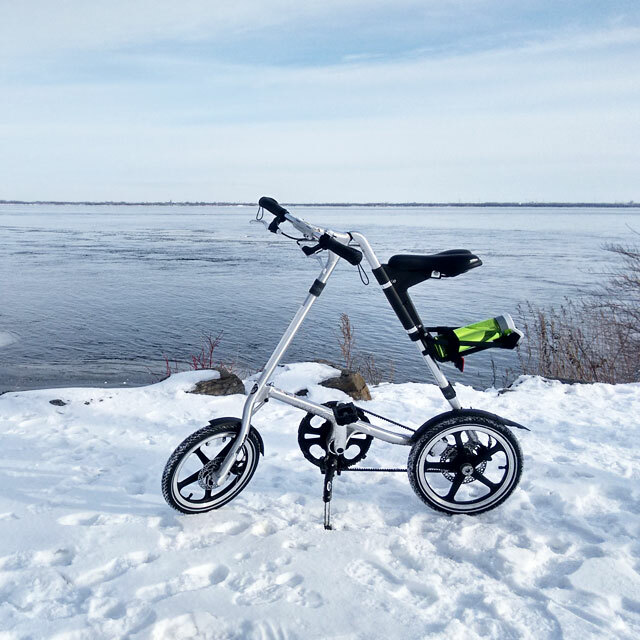 The wind keeps him in shape and the Strida survives the salt air very well. 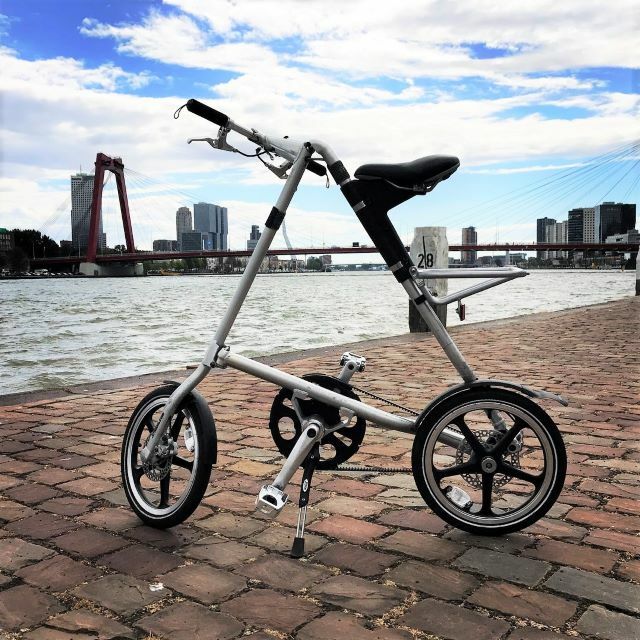 With no chain and the aluminium frame there are no parts on the Strida to corrode, this makes the Strida a useful folding bike to use near the salt water and on a boat. 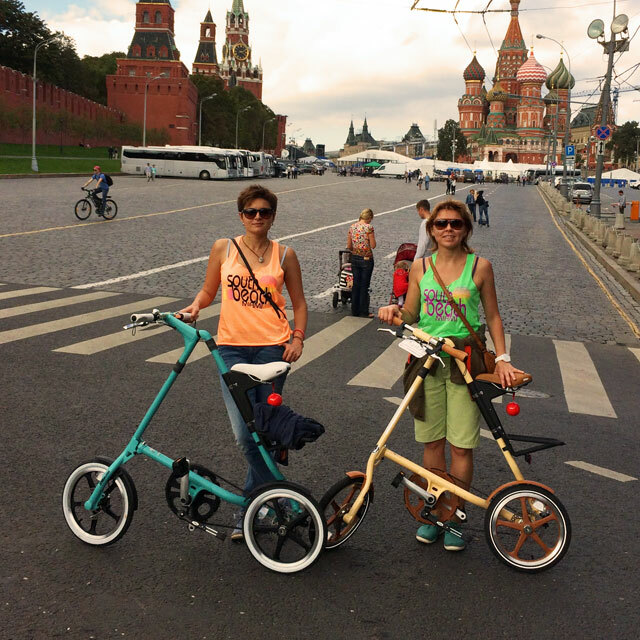 Liliya lives in Moscow and she like to travel, she purchased these two Strida Lts from me when she was visiting North America. 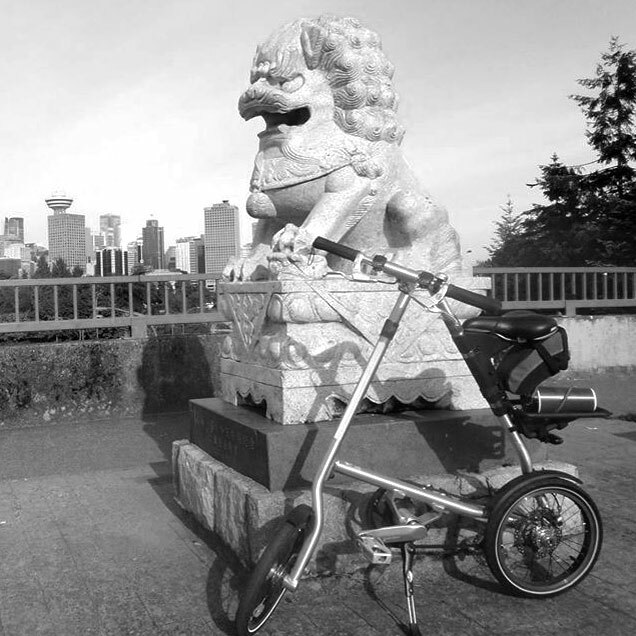 The Strida is easy to travel with so taking them home with her was not a problem. This Cream and Brown Lt is fitted with a Strida leather saddle and a Strida leather saddle bag. 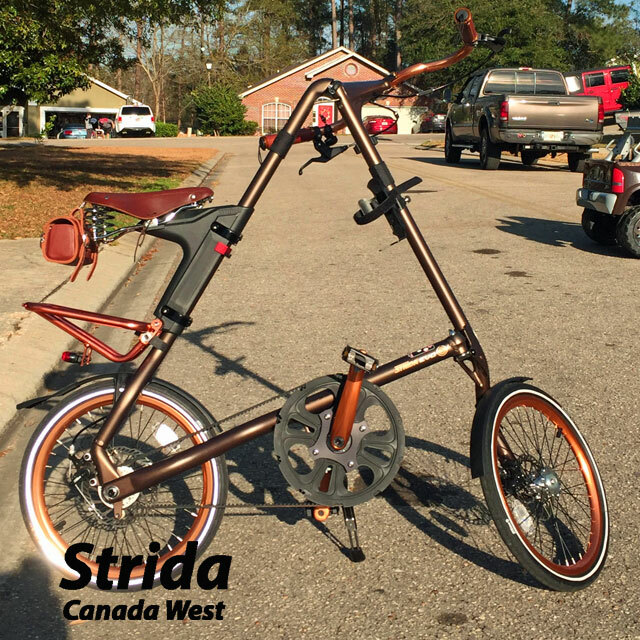 My hat goes off to Erik in Edmonton as Erik rides his Strida all through the winter! This is a photo he sent of his red Lt, he also has a new white EVO. 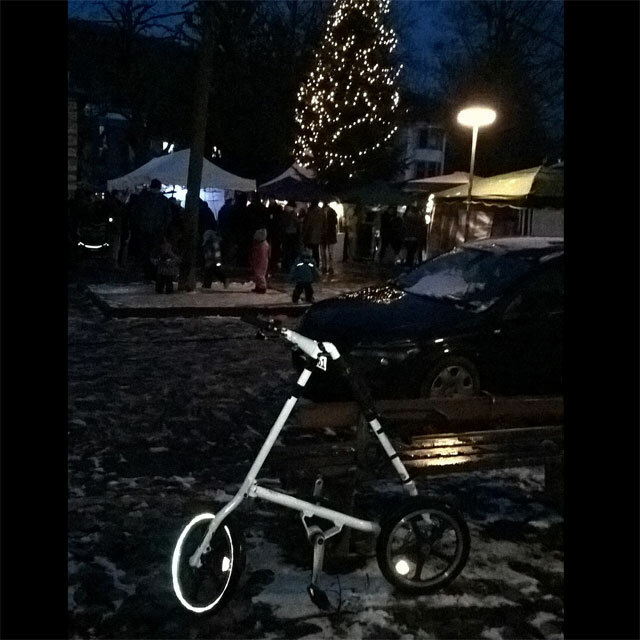 The next time you are riding your Strida and you get cold hands think of Erik and his winter commute. You may have noticed our Manhattan Special, it is a gloss black EVO with lots of specials. It was inspired and named by our NYC customer David. There are now Manhattan Specials located in NYC x 2, Washington D.C., Montreal, Richmond B.C., and Hong Kong. This bike deserves a photo album of it's own so if you own one please send photos. Yes there are Strida bikes in Alaska, at least two as Paul owns this his new Strida Sand Silver EVO and a red Strida Lt.
Strida Canada has two Strida customers who live in Barcelona Spain, this photo was taken by Peter of his wife Erika and their two Strida bikes on the beach in the winter.